I remember as a kid spending countless hours playing with Legos. I was happy if whatever I built didn't crash down under its own weight. Not so with the Arvo brothers (legends within the Lego community). These two take lego building to a whole new level, and beyond. Just as Wilco Machiels creates Porsche Dioramas like no one else, the Arvo brothers are masters of Lego creations and the 911 Carrera below is one of their most recent designs. The Arvo brothers don't just limit themselves to Porsche. Check out this original Citroen complete with parking boot and all. I don't know about you, but I'm not sure I could reproduce either of these with a full set of instructions and an engineer to help. 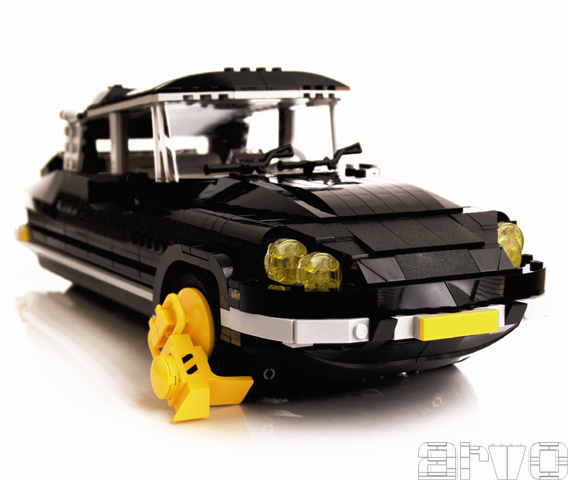 If you're interested in seeing more of the amazing sculpture created by the two Arvo brothers (and it's more than just automotive), they have a full gallery available via Brickshelf.com (a photo sharing service for those afflicted with the Lego bug). Graffiti Tagged Porsches to $1 Billion in Profit. SICK. How do I get my hands on one? I’m working on finding out now. I finally tracked them down, but it took some doing. I’ll let you know more either here or on Twitter!! I bet I could steal Barbie away from Ken easily if I had that ride. I saw that one when I was exploring around. If I remember correctly, it even has a working motor of sorts. I just didn’t like the fact that it wasn’t bodied. 🙂 Regardless, they are both cool and I couldn’t build either one. I’m not so sure. I think Barbie is into American Muscle. Anyone knows where to buy this Porsche Lego? My nine years son speaks about it all the time… and me too, I confess! His stuff is pretty amazing and I now have one gracing the shelf of my office. If I find more info I’ll let you know. I’ll try to find the necessary pieces to build one with my son. If I’m happy with it, I’ll share it in the next future.